In May 2015, I joined 22 American firefighters as part of the technical panel for the UL “Study of the Impact of Fire Attack Utilizing Interior and Exterior Streams on Firefighter Safety and Occupant Survival.” Myself and three others composed the international contingent from Australia, Ireland, the Netherlands and Canada. One of the first issues placed before the panel was what nozzle and hose combination should be chosen for the research burns as representative of the U.S. fire service. It soon became apparent to those of us in the international contingent that the selected combinations (smoothbore and combination fog) flowed, on average, up to six times more than our firefighters were using for a similarly sized residential structure. During the many discussions that followed, we also realized that the way in which we applied the water was also fundamentally different. For handline use, smoothbore nozzles are basically non-existent in Australia and Europe. Interior fighting is performed utilizing combination fog nozzles and using techniques switching between straight stream and fog as the situation demands, in both cases aiming for maximum efficiency. These techniques are based on those developed by the Swedish during the early 1980s (and somewhat earlier by U.S. Chief Lloyd Layman). They involve a sound understanding of the science behind the prevailing fire conditions and, in particular, those conditions that lead to rapid fire progression. 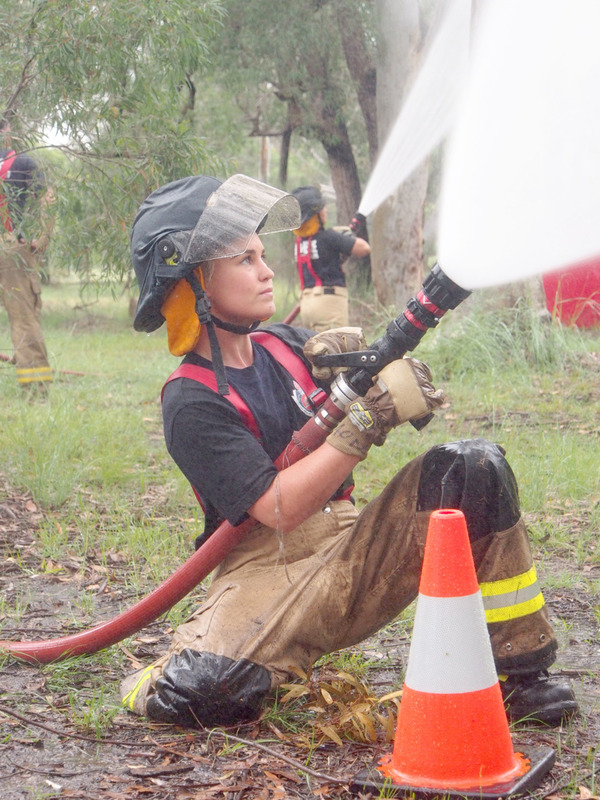 The following article explains the science behind these techniques and hopefully provides an insight into how Australian and European firefighters approach the use of water. Alongside effective search and rescue, the ability to extinguish a fire is considered a benchmark from which firefighters are judged by both themselves and their peers. But how do we judge if a firefighter has been as effective as they could have been during the extinguishment process, given the circumstances and equipment at their disposal? If a firefighter appears to perform poorly at an incident, is it fair to say they were insufficiently trained or did they do the best given the circumstances confronting them? There are times when fires go out quickly with what seems to be a surprisingly small amount of water. Some firefighters are able to do amazing things with a stored water extinguisher or a small low-flow, high-pressure line, but at other times are forced from a structure despite flowing large volumes of water. It soon becomes obvious that there is more to extinguishment than volume alone. Water is an amazing extinguishing agent, but we must put the right amount, in the right format, in the right place if we are to be truly efficient. Being efficient with water means we can utilize smaller, more maneuverable hoselines, thereby offsetting staffing limitations. Smaller hoselines can be moved more quickly to apply water faster for greater safety. In our modern fire environment, our time to put water on the fire becomes one of our most critical success factors. Using less water means that our water supply lasts longer—an equally critical factor in some areas. Assuming we apply the water in the correct format and put it in the right place, the key question then becomes: How much water is needed to extinguish a certain amount of fire? And this is where we can turn to science for some clear-cut answers. To simplify the process and help us conceptualize what is occurring as the water is applied, it is often beneficial to scale down and concentrate on what is happening at the most basic level. So let’s see what happens to a single droplet as it leaves the nozzle and travels through hot smoke and flames or lands on hot or burning surfaces. It soon becomes apparent how incredibly effective water can be as an extinguishing agent—if used with skill. Conversely, we can see how incredibly wasteful we can be if we don’t understand the processes occurring. There are also some basic physical principles that are occurring that help explain how water extinguishes. Simply put, gases will always flow from higher pressure areas to areas of lower pressure and heat energy will always flow from higher temperature (hotter) objects into lower temperature (colder) objects until a state of equilibrium is reached. This “flow” of energy is described by the second law of thermodynamics. Also, the ideal gas law, as well as mechanisms for heat transfer, are useful tools for understanding how water extinguishes. A fire produces heat (energy), and the heat release rate (HRR) is a measure of the fire’s intensity. Heat is measured in joules (J). 1,000 J is a kilojoule (kJ) and 1,000 kJ is a megajoule (MJ). A joule per second is a watt (W). Fires release heat over time, so it is more useful to measure energy from a fire in watts or, as in our case with structure fires, in MW (i.e., megajoules per second or MJ/s). To put it simply, for extinguishment, heat being released has to be transferred to the extinguishing media (in this case water). Consequently, the water application rate must match (and preferably overcome) the heat release rate. To get a gauge of what these terms represent, we can look at a small bedroom. The HRR needed to bring a compartment of this size to full involvement via flashover is generally accepted to be approximately 2 MW. Given sufficient ventilation, this HRR could be provided by a large single-seat sofa on fire. It is sobering to note that any given room in a normal residence has enough fuel to reach full involvement, becoming unsurvivable for residents and firefighters alike. Let’s assume that as a droplet that’s 10 degrees C (50 degrees F) leaves the nozzle, it travels into a layer of hot fire gases that are approximately 600 degrees C (1,112 degrees F). This represents a temperature where fire gases (composed of pyrolysis product and unburnt products of combustion) are approaching their auto-ignition temperature and will become fuel for rapid fire progress. Firefighters moving through or operating beneath these gases without cooling them do so at great risk. Even with modern PPE, radiant heat alone will limit their ability to remain in this area for long. This is an environment that firefighters must immediately remove themselves from or aggressively control (cool). Heat will move from the higher temperature (smoke) to the lower temperature (water droplet), and the temperature of the water will, in an instant, rise to 100 degrees C (212 degrees F). The energy necessary to raise the temperature of 1 kilogram (kg) of water 1 degree C is known as the specific heat of water. Water has a higher specific heat than most common substances, and this is one of the reasons it is such an effective extinguishing agent. Think of how much energy it takes to heat a liter of water to a boiling point every time you put on a kettle. Sometimes it seems like forever waiting for that first coffee of the morning. Another important aspect of heat transfer that must be considered is surface area to mass ratio. By increasing the surface area of our water, we expose much more of it to heat, and absorption is faster. Many thousands of separate droplets injected into the hot fire gases will absorb more energy, more quickly than a straight stream that penetrates straight through with only the water on the outside of the stream exposed. Smaller water droplets have larger surface area to mass of water, which means each droplet has more surface to absorb heat energy while having less water to heat up. These two factors mean small water droplets heat up faster. In terms of understanding that small objects heat up the fastest, we see this same concept applied when starting fires. Small pieces of wood (kindling) are used as the fuel when starting fires instead of large ones, because they have more surface area to absorb heat and less wood to heat up to their ignition temperature. So for a split second, our droplet of water has been heated to 100 degrees C (212 degrees F). Though our hot fire gases have also cooled a corresponding amount, they are still much hotter than 100 degrees C (212 degrees F), so the transfer of heat will continue from the fire gases to the water, which will vaporize and, for another split second, become 100 degrees C (212 degrees F) steam. This is where we have maximum energy absorption as the water changes state to a vapor. It takes an enormous amount of energy to change the state of matter. The energy necessary to turn water to steam is known as the latent heat of (water) vaporization. To turn 1 kg of water to steam requires 2,260 kJ of energy. When the steam is dispersed into the smoke layer, more energy will be transferred from the smoke layer, as the smoke is still likely to be hotter than the 100 degrees C (212 degrees F). The result will be a rise in steam temperature. This process will continue until a thermal equilibrium exists between the steam and the smoke. This energy absorption is known the specific heat of steam. Steam has a different value for the “specific heat” than water. This value is dependent on the temperature of the steam. For this calculation, an average value is used (300 degrees C; 572 degrees F). This process will continue until a thermal equilibrium exists between the steam and the smoke. To raise the temperature of 1 kg of steam 1 degree C, it requires 2,080 joules (or 2.1 kJ). When both values (Q1 and Q2) are compared, it is clear that the transition from 100 degrees C water into 100 degrees C steam absorbs more energy than the heating of the water until it reaches 100 degrees C. In this case, six times more energy is needed to transform the water into steam, than is needed to heat the water. In other words, if your water droplets are not turning into steam, you are leaving over 75 percent of the heat-absorbing capacity of the water unused. It can be observed that the influence of the starting temperature is limited. In order to simplify our calculations, we will use 3 MJ/kg as default value for the amount of energy that one liter of water can absorb. Realistically, when the fire service uses water, it will rarely lead to such a high value and we will never be 100 percent effective. We must also understand that the extinguishing mechanism is fairly complex and more processes are involved than discussed above. The above calculations deal only with the absorption of heat energy. When we introduce an amount of steam into hot smoke (or fire), there are additional processes occurring that also enhance extinguishment. Most firefighters would know that water increases greatly in volume as it turns to steam. Most could also relate the expansion figures of 1,700 times at 100 degrees C, but few would also know that this increases with temperature. In fact, the expansion rate at 600 degrees C (1,112 degrees F) is 3,980 times! This volume of steam causes two things to occur: displacement of air within the compartment and “inertion” of the fire gases. Steam is an inert gas. This is an important factor in firefighting. When steam is added to a gas mixture, its flammability range shrinks. At a certain point, the mixture will no longer be flammable and therefore rendered inert. While inerting depends on fuel composition and temperature, by introducing approximately 45 percent steam into an enclosure, flaming combustion will be unlikely to continue. It is very important to realize that the water vapor contributes greatly to the extinguishment effect. We utilize this when we perform an indirect attack. The intent with this form of water application is to produce enough steam within an area to absorb maximum energy from the fire while inerting the area, making it impossible for the fire to continue to burn. This type of attack was pioneered by American Fire Chief Lloyd Layman in the early 1950s. An indirect attack is capable of extinguishing fires with a HRR that is higher than the amount of heat that can be absorbed solely by the heat absorption capacity of the flow. During an indirect attack, the two effects (cooling and inerting/diluting) are both playing an important role. Conversely, a direct attack is limited to the energy that can be absorbed by surface cooling. If we take our previous example of a room fully involved, only the outside of the stream is in contact with the flames filling the room, which are burning in the gaseous phase. In this format, there is insufficient surface area to cause rapid vaporization, and as a result, most of the water will penetrate through the flames, remaining in a liquid state. While this can be advantageous in some circumstances, only the water that actually falls on burning surfaces will change state and absorb maximum energy. Any water on the floor, still in unvaporized liquid form, is essentially wasted, having used, at most, less than a quarter of its cooling capacity. Ultimately, more water will be needed to extinguish the same fire, as extinguishment is limited to the time it takes to apply water to all the burning surfaces and cool them below the temperature at which auto-ignition will occur. In many cases, this may not be such an issue, but in some, it may be the difference between gaining control or not, especially if the seat of the fire is in anyway shielded. That said, an effective indirect attack should always be followed up during overhaul with a direct attack to ensure that burning surfaces are sufficiently cooled and saturated to prevent re-ignition. Similarly, a direct attack is the best technique for a developing fire in the growth stage (or separate burning fuel packages), where fire is essentially confined to the burning fuel surfaces. The size of the droplet is an important parameter. If the droplets are very small, they will evaporate too soon after leaving the nozzle and only the smoke layer closest to the firefighter will be cooled. If the droplets are too large, they will pass through the smoke layer without evaporating completely. Some may hit the ceiling and will evaporate there, absorbing heat from the ceiling. Another possibility is that they drop to the ground. In this case, they will travel through the smoke layer a second time. The number suggested as the ideal size for such a droplet is 0.3 mm.1 Droplets this size should be large enough to provide penetration into the hot smoke and yet small enough to vaporize readily. A combination fog nozzle is required to produce effective droplets, and their size is dictated by several factors, including flow rate and pressure. Generally, an increase in flow rate will mean larger droplets, as will a decrease in pressure, but this also depends on the nozzle. Droplet size is less critical when extinguishing a fire, as contact with burning surfaces is beneficial for localized steam production and surface cooling. Conversely, when gas cooling, best practices dictate that we should try to place the droplets solely into the fire gases for maximum heat absorption. For this purpose, large droplets produced by high flow rates and low pressure are not best suited. For gas cooling, flows in the 26- to 60-gpm range (100 to 230 liters per minute, lpm) at 100 psi (700 kiloPascal, kPa) are normally used for maximum effect. On reaching the fire, the firefighter may decide then to increase the flow during extinguishment in order to match the intensity of the fire. Water can be used to extinguish fire or cool hot fire gases en route to the fire. Although the objective in both cases is to absorb energy, the application technique differs considerably in regards to where water is placed and how much steam is produced. In the following example, we will look at extinguishment of a fully involved room where the firefighter attacks the fire from outside the room on fire, in this case the hallway. From this position the firefighter is protected from the effects of the steam, with the room itself being non-survivable for any persons trapped within due to the fully involved nature of the fire. Inside the room we have a mixture of flaming combustion and unburnt fire gases and for both, the effect is the same once we apply our water droplets. When working at a 100 percent efficiency, the following amount of steam is produced, where 2.61 m³ is the quantity of steam vapor produced at 300 degrees C per liter of applied water. When water application is 100 percent efficient, a steam volume of 50 m³ will be generated after 5 seconds of applying water. This will aid in the extinguishment of the fire because the generated steam will have displaced all the oxygen and the remaining fire gases will be inert. This example shows that a flow of 60 gpm (230 lpm) should be capable of quickly suppressing at least 11 MW of fire, based on energy absorption alone. But this requires a very high percentage of efficiency, which, for many reasons, may not be possible. Needless to say, in this example, firefighters operating at only 50 percent efficiency should still achieve rapid extinguishment. In reality, firefighter efficiency will rarely, if ever, be 100 percent. Values as low as 50 percent or even 25 percent are more likely. Notably, less efficient firefighters can lack serious capability. Lower efficiencies are caused by water that flows away before being transformed into steam. The creation of steam is where most energy is absorbed and the subsequent presence of steam dilutes and inerts the flammable mixture—an extremely effective extinguishment combination. If we can identify a lack of efficiency, we can attempt to deal with this in several ways. One is to provide more training in an effort to increase the skill level of the firefighters applying the water so that more water is in the right format and applied in the right place. Some would argue that the easiest solution is to just apply more water. Even in a less efficient format, a large volume of water may ensure that enough water hits the fire regardless of the skill of the firefighter. Despite the issues that may occur with hose maneuverability, excessive water damage, crew fatigue and water supply, there is a part of me that objects to this, if for no other reason than a belief that efficiency and skill will create a safer fireground and should be our goal in all our fire service endeavours. Many fires—due to size, access issues and fuel type—will always need significant amounts of water as our ability to place our water where it can be most efficient is limited. Other fires, confined within an enclosure with limited access to air, will need water to safely cool hot fire gases if we are to enter and get close enough to attack the seat of the fire. Either way, a sound understanding of the theory of water extinguishment will go a long way to helping a firefighter choose the most efficient technique in order to make the most of the water they have.